These words by David Adam form part of the Felgild Compline (for Wednesday each week) in Celtic Daily Prayer. This calligraphic design by Pam French is also available as an A4 poster, an A5 poster and and A6 greetings card. 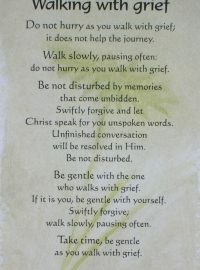 This poem by Andy Raine has been a source of comfort and help to many who are bereaved and grieving. The words are also to be found in Celtic Daily Prayer Book 1: The Journey Begins. The poem is also available in this design as an A6 greetings card and, with a different calligraphic design by Pam French, as an A4 poster. A book mark version is also available. 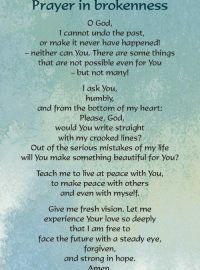 This A6 Postcard is printed with the words of 'A Prayer in Brokenness' which you can also find in the section of Celtic Daily Prayer Book 1: The Journey Begins entitled 'In Difficult Times'. 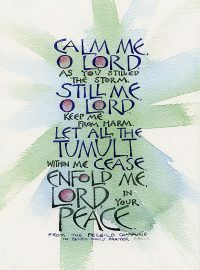 This A6 Postcard is printed with the words of 'A Prayer in Time of Darkness' which can also be found in the section of Celtic Daily Prayer Book 1: The Journey Begins entitled 'In Difficult Times'. 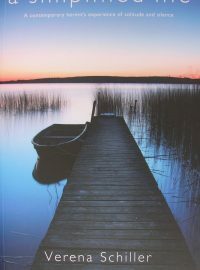 A DL format postcard with the Blessing from the end of the Small boat, great big sea Communion liturgy in Celtic Daily Prayer Book 2: Farther Up and Farther In which reads: When you no longer know how to be, may the Father take you on your deeper journey. When you no longer know what to do, may the Spirit reveal to you your fitting task. When all feels lost or foreign, may you know your home in Christ. 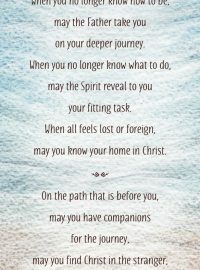 On the path that is before you, may you have companions for the journey, may you find Christ in the stranger, and may you know the love and blessing of God. 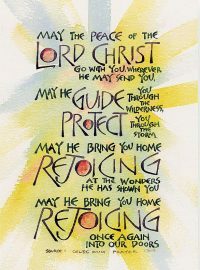 This is the blessing from Morning Prayer in Celtic Daily Prayer. This calligraphic design by Pam French is also available as an A4 poster, an A5 poster and an A6 Greetings card. 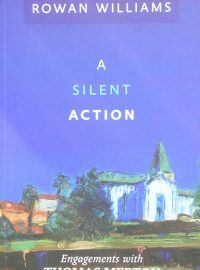 The celebrated spiritual writer Thomas Merton remains one of the most influential voices of our day. His many books have become modern spiritual classics and he opened up the riches of the monastic tradition for many. 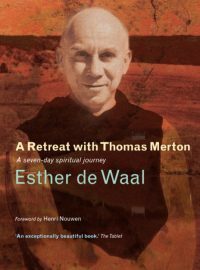 Here, Esther de Waal devises a seven day personal or group retreat programme using extracts from Thomas Merton's writings and a selection of the photography for which he was also renowned. She creates a retreat that can be made at home, at a centre or on holiday, over a week or a period of weeks. The focus of each of the seven days is: The Call; Response; The Solitary Within; Encounter With Christ; The Demands of Love; Common and Natural and Ordinary; Integration. As many people face the prospect of enforced change in their lives as western economies falter, this account of a life of radical simplicity freely chosen offers gentle life-giving wisdom for our times. A Simplified Life tells the story of what made a young Cambridge-educated woman embark on a solitary life, literally on the edge of the world with only a simple hut for shelter against the elements, and how that experience continues to nourish and enrich her today. 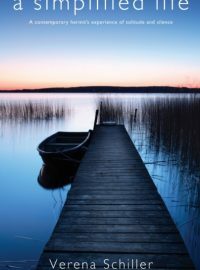 This poem by Andy Raine, one of the founders of the Community, has proved immensely powerful to many walking through the dark night of bereavement and is particularly appropriate for somebody who is grieving. This design is printed on good quality card and is also available as an A6 postcard. An A4 poster is also available with the same poem as a calligraphic design by Pam French. The Modern Catholic Classic that Helps You See the Sacred in Everyday Life I see the first rays of sunlight shimmering through a maple tree. And then in a twinkling I'm certain. I am standing before a tree full of angels dazzling me with their glorious presence. 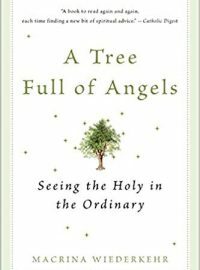 - From A Tree Full of Angels "A personalized invitation to stop, look and listen for God in the here and now... (Wiederkehr) wants us to gather up the crumbs, the little things in our lives, and realise they have the makings of a banquet". Abbot Jerome Kodell, OSB, Subiaco Abbey, Arkansas "Challenges us to remember the people in our past with a love that knows we will meet again, and look forward to the future with hope that God who so feeds us today has sent us an even greater banquet". Reverend Nicholas Ayo, University of Notre Dame Macrina Wiederkehr, OSB, is a member of St. Scholastica Monastery in Fort Smith, Arkansas. She directs retreats and workshops throughout the United States and is the author of The Song of the Seed and Seasons of Your Heart.